by Mark Cooley and Edgar Endress. Connection, dislocation, fear, communication, fragmentation, collectivity, intimacy, disembodiment are all possible and often simultaneously present in our attempts to interact with others online and off. Dear Internet is an experiment in collective publishing that attempts to investigate how networked technologies become platforms for the paradoxes of social relations in digital culture. Dear Internet began in 2006 as a kind of inversion of the security and authoring conventions of blogs and blogging. Dear Internet was set up as an unmediated publishing platform where users were urged to address the Internet directly and indulge in their deepest thoughts, feelings and fantasies with the abandonment, comfort and protection that only online anonymity can provide. Initially, letters rendered some interesting aspects of the complex relationships, or lack thereof, we have with the humans of the world. Sadly, but perhaps fittingly, contributions waned and the automated publishing platform gave way to spam. The blog is now an archive of spam email and seems to be establishing a “purely” networked identity – blissfully free from the messy and complex emotive states of humanity. 2009 update: blogger detected and removed the Dear Internet blog for violating blogger’s terms of service agreement. One or more webcam equipped computers are located throughout the installation space with internet browsers open. Through an established email account, to which installation visitors are given user id and password, participants are invited to email a letter addressed directly to The internet at: dearest_internet.user@blogger.com. All emails are inventoried and published at Dear Internet blog. Submitted letters are gathered from Dear Internet blog, remixed and randomly projected as scrolling ticker texts in the installation space. 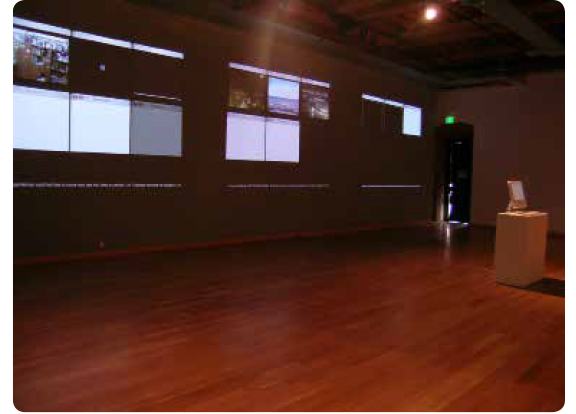 Accompanying scrolling texts are a series of image projections. 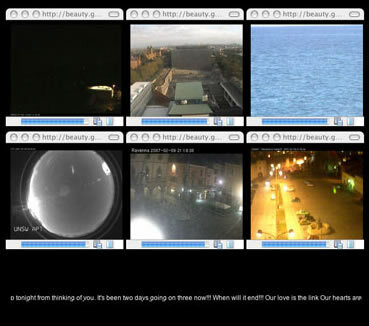 Projections feature webcam images of letter-writing installation participants accompanied by images accessed from anonymous live IP surveillance and web cameras. Installation audio consists of computer reading excerpts from submitted letters while being underscored and sometimes interrupted by cinematic scores and sound effects.